A great portrait is more than just a frozen reflection of the subject's appearance. It's a chance moment, blanketed in natural light, in which the subject's authentic self is visible in her expression, her stance, her aura. A great portrait blurs the line between a subject and her surroundings, all contributing equally to the overall impression of a singular human being. Photographer Barbara Yoshida captured not one great portrait, but 100. And to make it all the more glorious, her subjects are all female artists, groundbreaking in their own right. Louise Bourgeois, 1911-2010. Photographed 28 February 1992. Sculpture, installation art and painting, France © The Easton Foundation/Licensed by VAGA, NY. Beginning in 1990, the Portland-born photographer began documenting female artists, ranging from well-known art stars to emerging newcomers, those working in feminist performance, biomorphic sculpture, found object assemblage and West African textiles. Yoshida travelled to destinations around the world, from Tunisia to Gambia, entering these women's studios and homes, incorporating their natural habitats into their very essences. With each woman, Yoshida would engage in conversation with the artist, discussing details and memories of her life and work. She then, using a 4x5 large format camera and black-and-white film, would snap a particular moment of the interaction, a genuine encounter when the artist's spirit comes to the surface for a split second, a spontaneous moment. 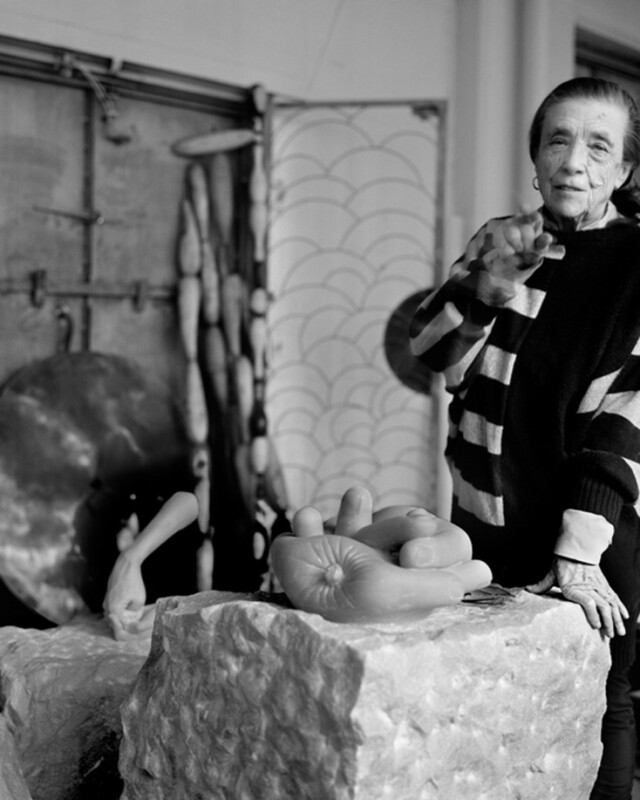 Whether it's Louise Bourgeois pointing a finger at the camera, her clenched fist coincidentally mimicking the clamped hand of the statue behind her, or Kim Dingle possessively holding one of her "Priss" statues as if it was her own child, each subject is draped in her life's work -- an extension of herself. Finally, Yoshida always asks for her subjects' permission before publicly releasing the photographs, believing strongly that every woman should have control over which of her images are spread throughout the world. With a process as respectful as it is revealing, Yoshida documents the pioneering, and all too often under-acknowledged, female artists of our generation. Her trusting and intimate portraits document the inner worlds of the art world's greatest female heroines, some of whom are no longer alive today. Yoshida's "One Hundred Portraits: Women Artists" will be on view from March 3 through March 27, 2015 at the Salena Gallery at LIU Brooklyn, in honor of Women's History Month. See a preview of the exhibition below and stay tuned for (way) more coverage in honor of our favorite month of the year. Photographed 21 February 1991, Painting, sculpture, photography, video and performance, U.S.A.
Photographed 6 July 2012, Installation art, painting and sculpture, U.S.A.
Photographed November 21, 1991, Sculpture and painting, U.S.A.
Photographed 25 August 1994, Painting, installation art, mixed media, U.S.A.
Photographed 29 November 2013. Painting, U.S.A.
Photographed 29 April 1992. Painting, printmaking and drawing, U.S.A.
Photographed 25 August 1995, Installation art and assemblage, U.S.A.
© The Easton Foundation/Licensed by VAGA, NY.